Posted on Thu, Dec 22, 2011 : 12:49 p.m.
Dave Brandon on an NCAA waiver that allowed Urban Meyer to begin recruiting for Ohio State: "I don't get it." An NCAA waiver that allows incoming Ohio State football coach Urban Meyer to recruit while outgoing coach Luke Fickell prepares the Buckeyes for a bowl game has Michigan athletic director Dave Brandon miffed. Ohio State, Michigan or any other school shouldn't be allowed a waiver that, in essence, allows a school to have two coaches, Brandon told The Detroit News. Rich Rodriguez was able to make phone calls in 2007 when he accepted the Michigan job. "I don't get it," Brandon told The Detroit News. "Because of circumstances, you're able to have a bloated coaching staff and divide responsibilities and focus. My coaches are running around, having to be at three places at once, and so is every other coaching staff in the country. "But that changes if you can go to Indianapolis (NCAA headquarters) and get a piece of paper that says you can have two coaching staffs. One can coach, and the other can go recruit. "Someone has to explain to me why that makes sense." Meyer, hired after a cash and tattoos scandal that resulted in the Jim Tressel's resignation, has verbal commitments from four five-star recruits. Mon, Dec 26, 2011 : 4:19 a.m.
Brandon,what a attention Diva.You can't AD Two Teams.See Ohio State is already in His head.The Big Ten Loves Ohio State.Its not a sport anymore,its a business.Thats why Michigan hired a Pizza Man.He knows very little about College Football,or he wouldn't keep making the statements he does.He talks More about Michigan's Football Team,than Hoke Does.Just be still,and let the players play,and the Coaches Coach. Tue, Dec 27, 2011 : 6:50 p.m.
You're misinformed, if at all. 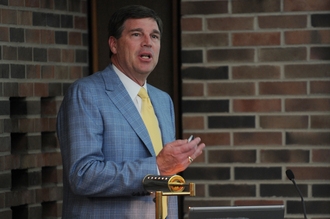 Dave Brandon came to Michigan on a football scholarship and played under Bo Schembechler from 1970 to 1974 ... he came to Michigan and took an almost 2 million dollar a year paycut for the privilege of being the AD at the best school in the country. There is no one team in Dave's head ... Michigan is in his heart, and therefore he is a watchdog. It's called doing your job; something many other ADs would do well to emulate. He went out and got a Michigan man ... O$U went and got a con man. Sat, Dec 24, 2011 : 8:48 a.m.
Fri, Dec 23, 2011 : 5:34 p.m. Kudos to David Brandon for speaking out. He had the courage to go against the grain. He included Michigan in his comments. Fri, Dec 23, 2011 : 4:36 p.m.
Fri, Dec 23, 2011 : 6:24 p.m.
Again, it's not a &quot;special dispensation&quot; but an existing NCAA procedure. Whether or not the procedure itself is BS, as your AD alleged, is a separate issue. It's also worth noting that UM is currently on probation for violations due to extra practice hours and having 5 extra coaches on staff from 2008-2009. Fri, Dec 23, 2011 : 2:44 p.m.
You have a fine coach for a lousy school with zero wins last season. The AD sends him off recruiting causing another reason for the Big Ten to dislike OSU's caustic athletic program. Why is the AD still employed? No bowls for at least 2 years in a row? At least the NCAA still loves you! Go Blue! Fri, Dec 23, 2011 : 7:02 a.m.
Ohio State is currently under three years of probation by the NCAA. Over the past decade, Ohio State has reported over 400 NCAA violations, the most of any BCS football program. A 1 year bowl ban and loss of 9 scholarships... ok. You also hired Urban Meyer, a beacon for ethical recruiting practices, just before you received three years of probation. The worst is yet to come Buckeyes. Fri, Dec 23, 2011 : 2:35 a.m.
Guys, guys, guys, who cares.....let em get the extra coaching staff, its apparently been done before, besides they're gonna need it with what Hoke &amp; Co. are building in AA. Brandon can worry about it, hes got the time. The suckeyes are in store for more violations, more &quot;all star recruit flops,&quot; another coaching change in 3-5 years and more BEATDOWNS at the hands of the Wolverines. Let those losers enjoy their Florida Bowlgame sponsored by who the h*** knows or cares, and get beat yet AGAIN by the SEC..........they wont be bowling next year, their bowlgame will be the Michigan game, when Urban reaches 0-3 against UM. M is back and it feels good!! Go Blue!! Thu, Dec 22, 2011 : 9:58 p.m.
Do you guys forget already that everyone does this? This includes your beloved wolverines when Rich Rod got hired. I don't necessarily agree with it but it is the rules and I am sure glad we have these rules now because Urban is tearing it up in recruiting. Bottom line is if Urban doesn't get the recruits that he has in these past few weeks we would never hear Mr Brandon cry about it and thats the truth. Can't wait till next year in Columbus! Go Bucks! Thu, Dec 22, 2011 : 11:08 p.m. Please read my post from earlier. It is less about OSU and more about a rule that does not lay a level playing field for all programs and contradicts the NCAA's mission. He even disagrees with the previous Michigan administration's use of it when Rich Rod was brought on. Also, this article is a bit behind, as I believe Mr. Brandon did make these comments before Urban started landing his recent recruits. I believe he first commented when the waiver was announced. I also can not wait until THE GAME next year in Columbus!!! Michigan will most likely be playing for entry into the Big Ten Championship Game, while OSU will probably be hoping to finish above .500. In honor of OSU's bowl ban next year, I propose we rename The Game to the Turkey Bowl, just for next year, because it will be the closest OSU will get to one. It is the least we can do for our friends in Cbus. Thu, Dec 22, 2011 : 8:35 p.m.
Thu, Dec 22, 2011 : 8:10 p.m. Outlaw, I don't think DB is crying so much as stating he disagrees with a particular rule that appears to go against the NCAA's mission of making sure it provides a level playing field. He is stating that no school should be granted that waiver and I'm sure this is more about discussing a rule and forming momentum to do away with it entirely. As this rule governs all athletic programs, it is his job to comment on his viewpoint and effect change if he sees fit. I have a feeling we might see an attempt to close this loophole in the future. The OSU, Your argument that Urban Meyer is using his own time to recruit is a nonargument and is ignorant of the facts. Urban Meyer is an employee of OSU, he is not doing any of this on his own time. He is recognized as an employee of the university and as being on the coaching staff by the contract he has signed and by the NCAA. It is the whole reason OSU had to seek a waiver for him to be able to recruit and hire coaches separate from the existing staff that can also recruit. It in essence allows OSU to double its coaching staff until after their bowl game. Now if you are implying that Urban Meyer can do whatever he wants and is doing whatever he wants, such as even recruit players right now during a dead period, until after the bowl game, you are wrong and are detailing NCAA violations. If you know of such activities, I'm sure the NCAA would love to know about it. I can provide you their number if you would like. :) As far as my opinion on the rule (pretending that anybody really cares what it is), I can understand the intent of the rule, but I really don't agree with it. I think it is a practice that should not be allowed. I am also of the stance that head coaches should coach through their bowl games and new coaches shouldn't be hired until the January timeframe. I'm not a big fan of the coaching changes that happen at the end of November and throughout December. Fri, Dec 23, 2011 : 6:21 p.m.
M4Life, I'd like to thank you, as an OSU fan, for having a well thought out response. Intelligent debates are few and far between on any type of message board or comment section. To comment on what has been said, the AD's comments, and yours as well, about doubling the coaching staff are not necessarily true. As of right now, new OC Tom Herman has been on a visit or two, but the recruiting efforts have been solely on Herman and Meyer. There is no other mysterious staff going out on these recruiting trips, as Fickell is currently coaching, Withers is coaching at UNC, and the other pieces are not yet in place. The picture has been painted that OSU is breaking ground with this waiver, yet 5 other teams have asked for and received the same thing this year. As for changes needing to be made to the NCAA in general...Amen. Thu, Dec 22, 2011 : 10:35 p.m.
Thu, Dec 22, 2011 : 8:09 p.m. Sorry OSU, your comment on what he does with his time doesn't make sense. If that were the case why would he need to get this waiver in the first place. The NCAA is setting a new precedent for allowing this which will come back around to hurt OSU in the future when other programs make coaching changes. Sun, Dec 25, 2011 : 8:22 p.m.
What Ohio fan makes sense? Thu, Dec 22, 2011 : 7:25 p.m.
What Meyer does ON HIS OWN TIME BEFORE HE BECOMES HEAD COACH is nobody's business, least of all, the NCAA's. If a new employee wants to spend his personal time preparing for their new job, it is nobody's concern, certainly not the new employer's chief rival. Blue: get over it!!! Fri, Dec 23, 2011 : 2:38 p.m. It's not &quot;ON HIS OWN TIME&quot; or are you unaware that he's been hired by Ohio? The waiver is a reward for a school that just got busted in a major scandal and, somehow, got a lighter penalty than USC. It's pathetic. Thu, Dec 22, 2011 : 7:12 p.m.
At least Dave Brandon has the courage to speak up when something doesn't look or sound right. You would think Michigan State and or Penn State would be having a issue with this as well. After all they are the ones so far that has lost recruites to Urban Meyer. Thu, Dec 22, 2011 : 7:08 p.m.
Actually OUTLAW it is a big deal that one school is able to recruit with one set of personnel and another staff to coach their bowl game yet everyone else is held to another standard. It's called a level playing field. Look it up. I find it humorous that you feel Brandon should &quot;focus on your own program and what's going on here&quot;. .......yet you obviously are not. So crawl back to Lansing or Columbus or whatever hole you came from and save your dribble for their boards. Thu, Dec 22, 2011 : 6:48 p.m.
Tue, Dec 27, 2011 : 5:05 p.m.
What you forget is Dave is the AD at the best school in the country! By paying attention to what other schools in our conference are doing, he is actually focusing on his &quot;own program&quot;. He is protecting our interests, and has the balls to speak up. Way to go DB! Go Blue! Fri, Dec 23, 2011 : 5:39 p.m.
Actually, the new verbal committs to ohio will have to think twice about losing 16 post season practices in 2012 and will not play in B1G Champsionship game and then a bowl game. You are actually losing out on two bowl games in 2012, if buckeye fans assume UM is going to be least 10 and 2 or 11 and 1 (loss to Michigan on that one). Thu, Dec 22, 2011 : 6:55 p.m.
what you can not stand the truth!. he is not wa wa waing. he is saying what other people are saying. I think you should think before making a statement like this. you are the one crying.